Find device-specific support and online tools for your LG G Pad X8.3. Learn how to get started downloading apps on your LG G Pad™ X8.3 from Verizon. Here's how to turn pre-installed apps on your G Pad X8.3 on or off. Here's how to remove or delete apps if your G Pad X8.3 is unresponsive, freezes or an app won't open. To view or close recently used apps on your LG G Pad X8.3, view this info. Learn how to use Google Now to automatically give you updates and information you want on your LG G Pad X8.3. Learn how to use Google Now on Tap on your LG G Pad X8.3. Discover how to use your voice in Google Now to write an email, create a calendar event, set an alarm and more on your LG G Pad X8.3. Discover how to search the web or your LG G Pad X8.3 simulator's contacts and apps using Google Now on your LG G Pad X8.3 simulator. Discover how to search for and download an app or widget in Google Play™ Store on your LG G Pad X8.3. A visual walkthrough for uninstalling an app or widget from your LG G Pad X8.3. Learn how to change smart notice options on your LG G Pad X simulator 8.3. Learn how to use Smart Notice on your LG G Pad X simulator 8.3. Learn how to find places around you in a chosen category using Google Maps on your LG G Pad X8.3. A visual guide on how to navigate to a location using Google Maps on your LG G Pad X8.3. A visual guide for how to add layers to Google Maps to view current traffic on your LG G Pad X8.3. Learn how to add layers to Google Maps to view current traffic on your LG G Pad X8.3 simulator. Learn how to use Dual View to view two apps at once on your LG GPad™ X. Discover how to use QSlide for multitasking on your LG GPad™ X. Take a picture and write on it with the Quick Memo + app on your LG G Pad™ X8.3. Find out how to add text to your QuickMemo+ screenshots with your LG G Pad X8.3. An interactive guide for using QuickMemo+ to draw and write on screenshots with your LG G Pad X8.3. Learn how to share your QuickMemos with your LG G Pad X8.3. Learn how to add and switch between remotes using Quick Remote on your LG GPad™ X. Learn how to set up Quick Remote on your LG GPad™ X to use your tablet as a remote. A visual guide for how to back up call history and messages with Verizon Cloud on your LG G Pad X8.3. Discover how to back up your contacts with Verizon Cloud on your LG G Pad X8.3. Learn how to back up photos, videos, music and documents with Verizon Cloud on your LG G Pad X8.3. 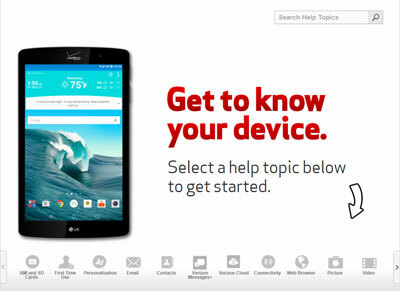 An interactive guide on how to download files from Verizon Cloud to your LG G Pad X8.3. Learn how to restore content to your LG G Pad X8.3 with Verizon Cloud. An interactive guide on how to set up Verizon Cloud to back up content on your LG G Pad X8.3. Find out how to get more storage for your Verizon Cloud account using your LG G Pad X8.3. Discover how to send a video message using your LG G Pad X8.3. See how to forward a text message using your LG G Pad X8.3. Learn how to reply to a text message on your LG G Pad X8.3. Discover how to send a text message using your LG G Pad X8.3. Find out how to send a text message to a group of your contacts from your LG G Pad X8.3. An interactive how-to guide for sending a text message with your voice on your LG G Pad X8.3. Discover how to get directions to a location using VZ Navigator® on your LG G Pad X8.3. Learn how to search for a local location using VZ Navigator® on your LG G Pad X8.3. An interactive guide for how to add layers to VZ Navigator® to view current traffic on your LG G Pad X8.3.